Meet the architects working with Nightingale housing - Learn about their design philosophy, what community means to them and why they were compelled to join the Nightingale family. Can you tell us a bit about your practice – what inspires you & your team? Hayball is one of Australia’s largest design practices, specialising in architecture, interior design and urban planning. We’ve been in business for over 35 years now, and have designed hundreds of projects across Australia, South-East Asia and China – everything from single and multi-residential buildings to schools and universities, commercial developments and urban design for entire suburbs. Our inspiration, as a practice generally, and for our CRT+YRD building is always to design from first principles. Designing places that people are happy to inhabit. How do you embody the idea of community and teamwork within your practice? Hayball is built on a culture of collaborative research-led design, with staff-initiated processes in place to provide useful feedback, mentoring, and transparent, non-hierarchical design development. We encourage our team to think outside the box and embrace new technologies as well as supporting staff research projects and pro-bono work. We try to focus on designing buildings that make a positive impact for the occupant, community and the world. We have a strong history of contribution back to the industry and community. It is part of our founding ethos to improve the world we live in through meaningful built environment outcomes. We take pride in our progressive and inclusive workplace culture and are committed to providing ongoing opportunities that support local communities and industry and advocating for architecture’s contribution to sustainable communities, urbanisation and the public realm. The central, private courtyard provides residents with dual outlook, natural light and cross ventilation. Why did you personally choose to become part of the Nightingale Housing Architect community? We strongly believe that the values of Nightingale Housing are aligned with our own values, hence our commitment to this project. The Nightingale model is unique in that it is currently completely architect-led and managed from initial land purchase, to design and all the way to completion. Architects are in a unique position to be able to influence the outcomes within our world in a positive way. This opportunity with Nightingale Village gives us the chance to pursue our desire to design socially sustainable and ethical buildings, giving back and contributing to the wellbeing of the planet in a bigger way than usual for us and so, we jumped at the opportunity. Our investor pool comes totally from within our firm – something we are very proud of, and something that signals the fact that our practice and people support Nightingale goals and model. What excites you specifically about being part of Nightingale Village? As architects, we were excited by the idea of working collaboratively throughout the design process with a great team of architects that we admire and who are pushing the boundaries in design and working at the forefront of emerging models of development. Being able to take part in the conception of an entirely new precinct that will provide a home for a whole community was also part of our attraction to the project. Being involved in this kind of project makes everyone within the team question every decision that is made – we keep each other accountable and share knowledge for the benefit of the overall outcome. From energy saving and environmentally sustainable initiatives, to the use of robust maintenance free materials, we collectively bring about positives for the occupants, community and planet. What type of atmosphere and community will your building help to create for its future residents? Our design for CRT+YRD aims primarily to provide a healthy environment with embodied positive spatial qualities. A building that provides above all a true sense of belonging, a long-term home for its residents with an inbuilt adaptability and opportunities to mould the building and community to suit individual lifestyle preferences. 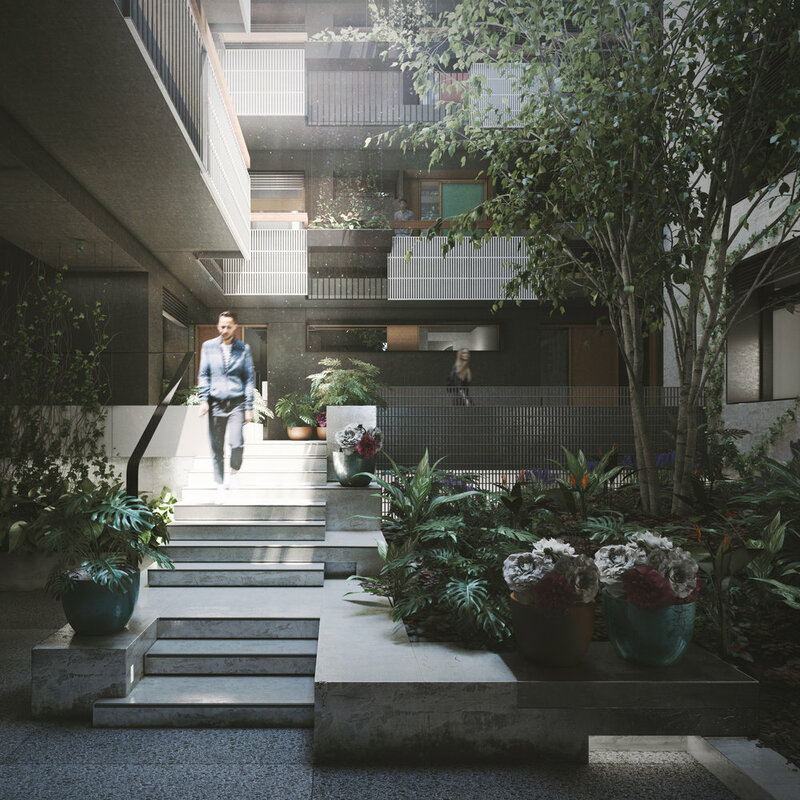 By designing from the inside out and focusing on the resident, we’ve ensured that all homes provide the possibility of both connection and retreat, with landscaping, plants and shared garden spaces contributing to the oasis of calm at the core of the building and supporting a healthy vibrant community. Hayball have ensured that all homes provide opportunities for connection and retreat, with carefully curated spaces for living. How have you and your team used innovation, sustainability practices & materiality choices to inform your building’s design and create an opportunity for savings to be passed onto the purchaser? Now more than ever there is a need for socially, environmentally sustainable & financially viable homes. There is a huge cohort of design-savvy and ethical purchasers, people who understand what they need to live a good life and are happy to forego the traditional quarter acre somewhere in the outer suburbs, when they can experience the same level of comfort and privacy while also making use of the additional amenity and proximity to community and culture. They will lose nothing, but they’ll gain a home and lifestyle that allows them to create meaningful networks and build a neighbourhood on their own terms. As an established practice with a broad range of experience, what skills do you think you bring to the table that will make CRT+YRD a unique home for nightingale residents? We work from a premise that truly exceptional results rely on the right blend of creative and practical. We design buildings that are precisely tuned to the needs of the occupants. Our history and experience allow us to bring to the table a collective consciousness from across our entire practice as well as the lessons learned across an enormous range of projects and sectors. Our whole ethos of design revolves around research, development, testing and refining knowledge that is directly applicable to this project. Specific to CRT+YRD, we can apply a range of spatial design techniques that amplify available space and utilise every inch of area to add both liveability and value to owners. Working in collaboration with Hip V Hype and Atelier Projects, Six Degrees Architects are leading Nightingale 2 to completion. We speak with James legge, director and NG2 project lead about his stance on environmental sustainability, community and the architectural rigour employed in responding to NG2’s unique site. James, Can you tell us a bit about your practice – what inspires you & your team? Six Degrees has always been interested in People, how they inhabit space, how they interact, how architecture can provide a stage for, and allow for, people’s lives in all their complexities. In all the projects in which we are involved, from Bars to Libraries to Community Hubs to Nightingale homes, we look to people and their lives for inspiration. Six Degrees has grown steadily over the past 27 years from a 6 person practice to the 32 person practice we are today. Throughout, we have remained a friendly and collaborative practice and tried to maintain as flat an organisational structure as possible. It is important to remember that it is always a team that is responsible for the delivery of a project and Nightingale 2.0 is no different. Many hands and minds are involved, both from Six Degrees and all other members of the project team. That’s simple, I was involved as an investor, along with a lot of other architect friends of Jeremy’s, in Nightingale 1.0. It was exciting to see The Commons evolve into the Nightingale Model. Then Jeremy asked me to run the next Nightingale. He teamed us up with Hip V Hype as development managers and off we went looking for sites. What excites you specifically about your work on Nightingale 2? Nightingale 2.0 has been an incredibly difficult but rewarding site to work with. Being unencumbered by any adjacent buildings means that we are able to get light, ventilation and views from all sides. However sitting adjacent to the railway and on a corner or two roads, has meant protracted negotiations with numerous authorities for everything from light easements, removal of overhead power lines, to crane access during construction. Now that we are largely through most of this, it is exciting to see the building going up and the twenty new homes, and three new retail tenancies that will help to further activate this precinct in Fairfield. I am most looking forward to seeing the building covered in plants and the activity of daily life clearly visible from the street. What type of atmosphere and community will your building help to create for its future residents?Nightingale 2.0 sits in a small but active precinct in Fairfield, that serves a vibrant local community. The future residents will become a part of this local community. We firmly believe that community can be fostered, enabled and encouraged through architecture, but it will be up to the residents themselves to create the community they want. The nightingale 2.0 residents are already off and running, having got to know each other at various purchaser events and site tours, they are now communicating through social media platforms, and will soon be bumping into each other in the walkways, laundry, bike store and roof gardens of the new building. Six Degrees has a strong background in Environmentally Sustainable Design and sees it as a fundamental aspect of good design. Nightingale 2.0 has pushed this interest even further. Looking at lessons learnt from previous projects, both our own and Nightingale 1.0, we worked with HvH Sustainability to achieve an average NatHERS score of 8.6 stars across all of the homes, an incredible result. Engaged thermal mass, solar orientation, cross ventilation, PV cells, an embedded energy network, the re-use of rain water along with many other features all combine to significantly reduce the running costs for the future residents. With excellent access to public transport, Nightingale 2 sits adjacent to the Hurstbridge train line; how have you designed your building in response to this? The station, zero carparks, plenty of bike parking and a planned carshare vehicle out the front, all help to discourage the use of private cars. A green travel plan, incorporating the spending of Owners Corporation contributions on green travel for residents, further encourages everything but private car use. Monthly site walks with Nightingale 2 residents has just commenced, what is it like working with residents during the design stages of a building and then being able to walk them step by step through the construction process? It is great to experience the construction of the project with the future residents of the project. It is wonderful to see their excitement and comprehension as various stages of the building are completed. None of us quite expected the views that you get over leafy Fairfield from the rooftop. Meet Madeline Sewall, the Project Lead on Breathe Architecture's Skye House of Nightingale Village. Having been part of the Breathe family for 4 and a half years, Madeline is looking forward to moving into Skye House upon completion. Until then, she can be found working on Skye House's detailed design, material selection, liaising with consultants and project managers in order to deliver Breathe's second Nightingale Building as part of the unprecedented Nightingale Village. Read on to learn about Madeline's Nightingale experience. Breathe Architecture is a team of 16, based at The Commons in Brunswick. Each individual member contributes a unique perspective to our approach, and we believe that the diversity in our studio contributes to an open-minded, creative team that allows us to problem solve beyond conventional approaches. Our greatest strength lies in strategic thinking, and we are always pursuing an outcome that is more progressive that those before it. We have a collaborative project approach, and most projects are touched by many hands through the course of design, documentation & construction. We have all-in fortnightly design reviews, which is an opportunity to get feedback from the whole team – this is often where we come up with our best ideas! The Breathe Team is a close knit group, and we are constantly striving to “work smarter not harder.” We endeavour to bring balance into our workdays by meditating together in the mornings, and sharing a (vegan!) team lunch together on Wednesdays. 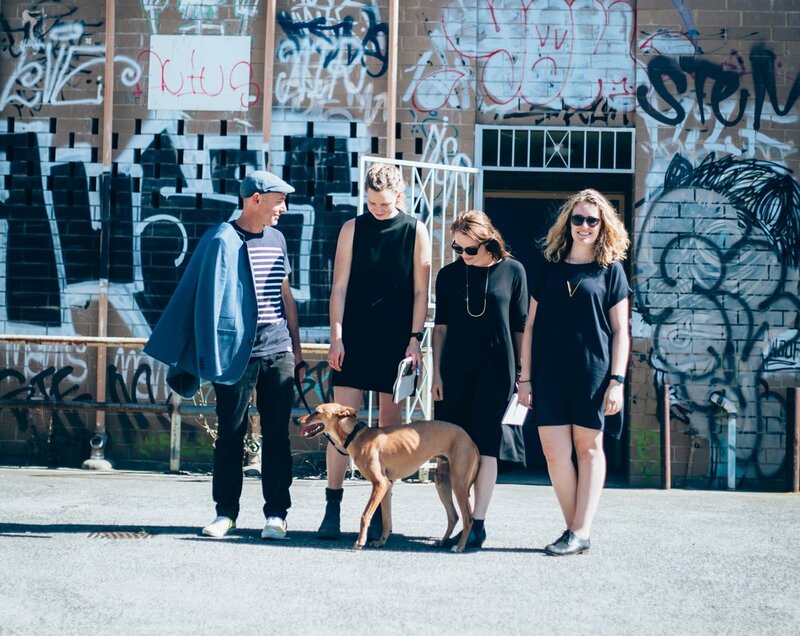 Outside the office, you will find us eating our way around Brunswick or walking the neighbourhood & office dogs. Building on the success of The Commons, Nightingale 1 across the street was our first project to be delivered under the Nightingale Housing model. After investing in much of the legwork & intellectual property that gave rise to Nightingale 1, we opted to share this information with the greater architecture community, giving rise to Nightingale Housing, which now operates as a separate not-for-profit entity. At Breathe, we believe that working collaboratively (not competitively) with our peers is the best way to improve the state of the housing market. We are grateful to see this information being used for good by so many great architects. 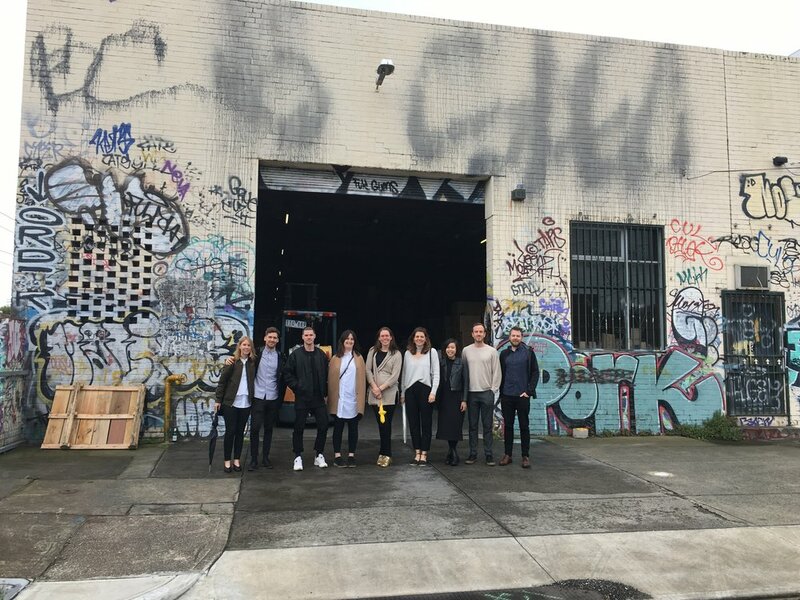 Madeline on site at Duckett Street, Brunswick with Breathe directors Jeremy McLeod and Bonnie Herring, and Breathe Associate Fairley Batch. What excites you specifically about Nightingale Village? Nightingale Village is an exciting opportunity for us collaborate with our peers & consultants on a strategic and ambitious project. The size of the site allows us to think at a master-planning scale, and gives us greater opportunity to make a positive impact on the neighbourhood. Through moves like the Duckett St Pocket Park (closed off to cars), and the creation of additional green spaces, we hope that Nightingale Village will bring joy not only to our residents but to the greater community as well. The precinct approach also allows us to to find efficiencies in ESD technologies and building systems, which enables us to explore more innovative outcomes. 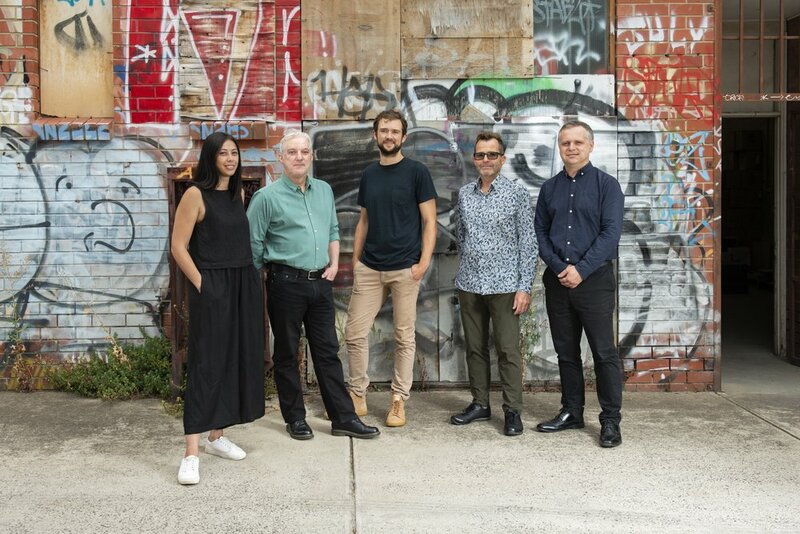 As a team, we hope that we can use our combined resources and brainpower to make Nightingale Village an example for sustainable, community-oriented housing that will have a positive affect on Melbourne’s current state. Breathe’s building – Skye House – will deliver a range of homes from small 29m2 teilhaus units, to spacious 82m2 2-bedrooms apartments. We hope that this spread in size & price point will encourage a diverse community of residents to form- from first home buyers, to families & downsizers. Our building will include a Guest Room, rentable by Village residents, which will allow family members and friends to stay and visit residents. Our rooftop will feature spaces for all types of use – introverted nooks for reading and relaxing, and larger spaces for socialising and entertaining. Additional rooftop amenity include a garden bathhouse, a roof top laundry, productive gardens and a dog park! We hope these shared spaces will encourage the community to engage with and enjoy each other. Our strategy with Skye House to build on the successes of The Commons & Nightingale 1, and aim to do better. We will use the same approach of material reduction, building only what is needed. This means using raw materials that age well without the need for paint finishes, and reducing applied materials like plasterboard & tiles. This material savings gets passed onto the purchaser. Skye House will be fossil fuel free, using an embedded network & green power for cooking and domestic hot water. The building will also feature a rooftop solar PV array, water tanks, bike storage, ceiling fans and vegetation throughout. We are looking at hydronic heating with no mechanical cooling, instead relying on good passive design & cross flow ventilation for thermal comfort. This means running cost will be significantly lower than standard apartment buildings, resulting ongoing affordability for residents. As part of the project team you will be moving into Skye House upon completion; what aspects of Village life are you most excited about and what do you hope to learn from living in the building that you helped bring to life? Yes! Working in The Commons has given me an excellent idea of what my future at Skye House could be like! I am looking forward to living in an environment of like-minded individuals who invest in their building & community. I love the energy created by the residents & commercial tenancies on Florence Street, and I can’t wait to be a part of a similar neighbourhood at Duckett St. I love to be outdoors, so I am also excited about the village amenity, like the rooftop, pocket park, and green space. I hope that living in the Village will give me insight into what elements are successful, and what aspects we can learn from for our future buildings. I hope that we can continue to improve Nightingale with each iteration, and I am looking forward to playing a small part in its evolution through my involvement and future residency at Skye House. North Melbourne's Clare Cousins Architects (CCA) has a keen interest in the way people respond to and engage with their environment, the creation and organisation of space and architecture that nurtures community. As an inaugural investor in Nightingale 1.0, CCA has designed award-winning bespoke housing for more than a decade is now pleased to be leading their own project within Nightingale Village along side her community inspired contemporaries. We are a team of 9 based in North Melbourne. We are passionate about creating high amenity housing and projects that nurture community. We love creating spaces for people to live and grow in, and buildings which will get better over time. We enjoy classic tunes, Friday lunches at our local, the Townie, and long walks on construction sites. As a relatively small team, we enjoy the benefits of working closely with each other, sharing triumphs and learning from challenges on each project. We’re also lucky to share a fantastic Brutalist office space with builders Maben Group, and can’t wait for the weather to warm up again to enjoy a barbie on our shared deck. The realities of Melbourne’s housing market are a consistent source of disappointment to our team. Not enough new homes are being built to suit the housing demands and too often the quality is poor. Rather than high density in the CBD and urban sprawl in the outer suburbs, we need good quality, medium density housing in our inner suburbs to meet Melbourne’s housing needs. Clare became involved as an inaugural investor in Nightingale 1, and we watched its progress with great interest. The establishment of Nightingale Housing brought an opportunity to lead our own Nightingale project, providing an opportunity to challenge the status quo. Early in our search for a Nightingale site we were disappointed to be outbid for land on several occasions, but ultimately it was worth the wait to secure a site on Duckett St and be part of Nightingale Village. Nightingale Village is giving our team a rare opportunity to collaborate with and learn from our valued architectural colleagues and friends. Nightingale Village is a proposition greater than the sum of its parts. With 7 buildings, we are able to have a greater impact on the public realm and deliver precinct wide facilities like the Go-Get Hub. Nightingale Village is committed to generosity within the public realm with moves such as greening and widening the Upfield bike path, and the creation of multiple public gardens and green spaces throughout the village, like the Mews to the north of our site. We are excited by the creation of a community, not just within the individual Nightingale buildings but across the greater precinct. Within our building and within the Village, we’re creating an opportunity for a community of likeminded people to grow. Nightingale CCA is creating space for people to connect and neighbours to get to know one another, as well as quiet spaces for people to reflect and recharge. Incidental interaction is encouraged with communal space and facilities; a shared laundry, open air clothes line, outdoor dining areas, productive garden and bike store. Like other buildings in the village, Nightingale CCA will help to activate the edges of public space with a commercial offering fronting Duckett Street and a two-bedroom apartment orientated to northern mews. Like all of our projects, our Nightingale apartments will utilise robust materials that are appropriate for the context that will age well with time, reducing lifecycle and maintenance costs. We want our apartments to work for our purchasers now and well into the future. We believe in quality over quantity, understanding that bigger is not necessarily better, and that efficient, well-conceived spaces can be just as delightful. Nightingale CCA is conceived around passive design principles, all projects are fossil fuel-free and deliver at least a 7.5 star NatHERS rating. Buildings will feature double-glazed doors and windows, cross ventilation, ceiling fans, low VOC finishes, low energy consumption fittings and a 24KW solar panel array to reduce energy consumption. The delivery of 7 projects within the Nightingale Village enables efficiencies of services and construction, the benefits of which will be passed on to purchasers. We’re really excited to get to know our purchasers, understanding what is important to them and guiding them through the process of this exciting project to deliver 25 great new homes.